Bats Want a Bat Week! Baturday News is a weekly blog written by Rachael, a middle school student and Save Lucy volunteer. Rachael’s interest in bats was sparked by the big brown bats that used the outside of her former home for a winter roost. Her family cheerfully hosted the wild colony for years. Why DON’T bats have a bat week?? Hi everyone! I know you have seen all the shark stories in the news lately. Sharks are biting people at the beaches. Personally, I have decided to stay away from the beach this summer. The bats have other plans. They are a little upset because of all the attention sharks are getting. I think they are jealous. Last night, I heard all of them talking about going to the ocean. They want to swim around and look scary so everyone will pay more attention to them. Poor little things. Have you seen them? Even when they show their teeth, they don’t look too scary. I heard one of them coming up with a plan to solve that little problem. She is planning to get tangled up in a lifeguard’s hair! I think that should get them in the news. I did my best to talk them out of it, but if you’re going to the beach, don’t forget to look up. And lifeguards beware! Don’t say I didn’t warn you! Of course, we could solve the problem easily if more people would just pay attention to our little furry friends. Maybe say “hi” to them if you see them flying around. 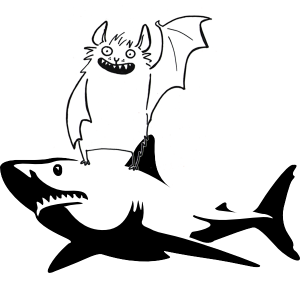 Maybe the Discovery Channel could have “BAT WEEK” instead of “Shark Week”…just a thought. Instead of a shark fin being part of the “A”, a lovely bat wing could be included. In other news, I saw some more bats flying outside my house! I was out yesterday evening and they were all flying around. There were a lot of bugs flying around, so the bats were able to get a lot of yummy food. I was extra happy about that. I think they were big brown bats. Previous StorySchool’s Out; Stay Up Late!